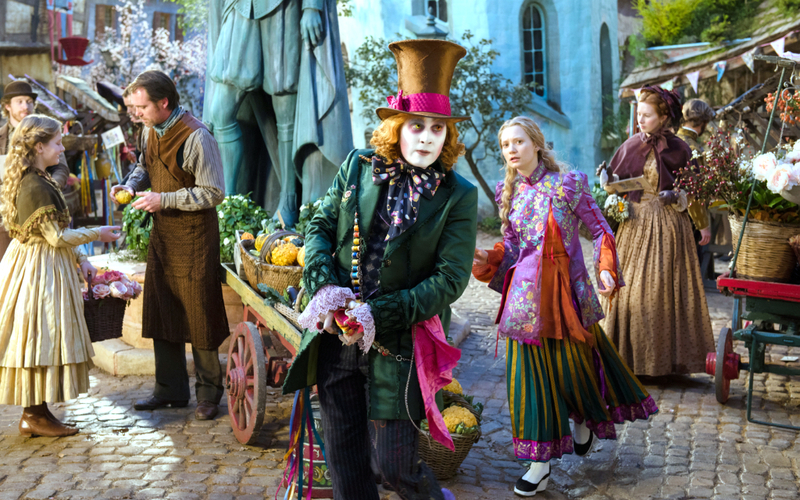 Alice Through the Looking Glass is the follow up from Tim Burton’s 2010 Alice in Wonderland. In this second installment, we find Alice, Mia Wasikowska, the captain of her own ship in the late 19th century. She has spent many years discovering the new world on her dad’s ship ” The Wonder”. When Alice returns home she finds that so much has changed from when she first left. They waste no time in Alice discovering the Looking Glass that leads her into Wonderland for another adventure. Wonderland has been very quiet since the banishment of the Red Queen, Helena Bonham Carter, but it seems the Hatter, Johnny Depp, is not the same happy mad man we saw in the previous film. Hatter discovers a clue that leads him to believe his family is still alive. It is up to Alice to now travel back into time to discover if the hatter has really gone mad this time or if his family is really still alive. This sends Alice on a journey that leads her to see how our past mistakes can shape who we become and leads her to see that some things in the past you just cannot change. It takes a while for the movie to get into its groove but the real standouts are our furry and timely supporting characters. For a movie based on time they definitely didn’t use their time well in this lackluster second installment. I was not impressed with this follow up and many in the theater with me felt the same way. I would Wait for this film to come on TV but hey I am only one person with my own opinion. Are you going to see Alice Through the Looking Glass this weekend? Alice Through the Looking Glass opens everywhere 5/27. Purchase your tickets in advanced from Fandango and don’t get sold out!